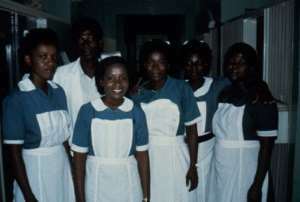 Sunyani, June 11 GNA - Nana Kwadwo Seinti, Brong Ahafo Regional Minister, on Thursday appealed to nurses to resist the attraction of the exodus bandwagon to foreign lands and render services in their communities. He noted that apart from the loss of health personnel to other countries, those who remained in the public sector were drifting towards private health providers internally for better working conditions of service. Speaking at the inauguration of the Community Health Nurses Training School at Tanoso in the Tano District of the Region, the Regional Minister noted that the situation as well as the brain drain had left the public health facilities with few personnel. Nana Seinti said the Government's decision to establish nursing training schools in each Region as well as the establishment of new health institutions of higher learning and the rehabilitation of existing ones, was aimed at addressing the severe human resource problems in the public sector. "Producing the right numbers of health personnel to provide health services to the population is the only way Ghana can meet the millennium goal of health for all by the year 2015", he said. He expressed the hope that the schools would be nurtured to serve the purpose of their establishment. Alhaji Dr Mohammed Bin Ibrahim, Regional Director of Health Services, appealed to chiefs in the area to make stool lands available and free from all litigations and encroachments for projects in the Health Sector. The Regional Director explained that the Community Health Planning and Services (CHPS) was a key strategy of the Ministry of Health (MOH) and the Ghana Health Services to bridge the inequalities in access to basic health services and reduction of poverty. "Community Health Nurses are very critical for reaching the poorest areas and the most vulnerable communities", Dr Ibrahim said, adding that they were key health personnel for the achievement of the targets of the Health Sector's priority areas such as reduction in child and maternal mortality, TB, HIV/AIDS and other diseases. He said the school would increase its enrolment from 30 to 80 next academic year, whilst the second batch of the health AIDS training programme would also increase its enrolment from 55 to 66. Dr Ibrahim announced that a nursing training college would be opened in Sunyani in October and advised interested youth in the Region to study seriously in order to gain admission. Mrs Josephine Koranteng-Asare, Principal of the School, said it was started in October last year with 30 students made up of 27 females and three males. She said the school lacked tutors; accommodation for staff and students and means of transport and appealed to stakeholders and the District Chief Executives to assist it to grow to become one of the best in the country.